(January 26, 2016) – The Boston Global Forum (BGF) has introduced the BGF-G7 Summit Initiative, in which we will cooperate with Japan – as the summit’s host, to convene leading scholars and business, government, technology and other leaders to seek solutions to pressing global issues involving peace, security and development. The G7 represents the seven leading industrial democracies. Proposals from the initiative will be sent to the national leaders at this year’s G7 Summit, to be held in Japan on May 26-27. Based in Boston and Cambridge, Mass., the Boston Global Forum brings together thought leaders from around the globe to participate in forums to discuss critical world issues. Photo: Four moderators of the dialogs (from left to right): Gov. 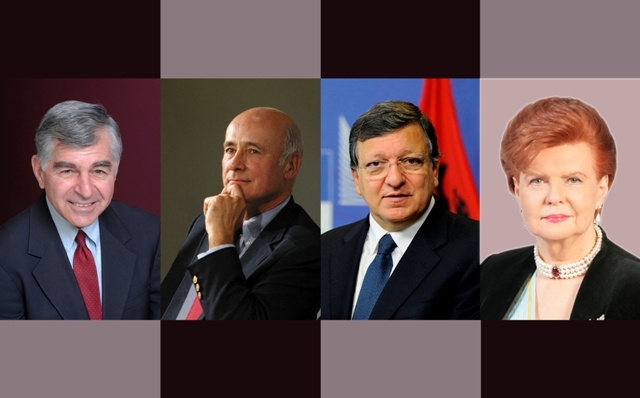 Michael Dukakis, a co-founder and the chairman of the Boston Global Forum; Prof. Joseph Nye, University Distinguished Service Professor at Harvard University; Jose Manual Barroso, former president of the European Commission; and Dr. Vaira Vike-Freiberga, president of the World Leadership Alliance Club de Madrid and former president of the Latvia. The initiative will include 60-minute-long online dialogues featuring one speaker in each discussion – usually an internationally recognized scholar or government, business or technology leader – who will present his/her perspective on an issue, followed by interactions among 100 excellent discussants (of a wide range of ages and backgrounds) participating online from various locations around the world. The discussion will continue as participants send questions and opinions to each other by email. The Boston Global Forum’s Special Editorial Board will gather their insights and send them to the speaker. There will be 12 of these dialogues, with the first on Feb. 2 and the final conference to be held on May 9 at the Harvard University Faculty Club, when the most promising ideas from these dialogues will be summarized and then reported to the national leaders meeting in Japan. A similar program will be held every year before each G7 summit, in which we will cooperate with the host country, with a particular issue to be selected as the focus. This year’s main topic will be Strategies for Combating Cyberterrorism. Our distinguished moderators at these forums will include former Massachusetts Gov. Michael Dukakis, a co-founder and the chairman of the Boston Global Forum; Prof. Joseph Nye, University Distinguished Service Professor at Harvard University; Jose Manual Barroso, former president of the European Commission; and Dr. Vaira Vike-Freiberga, president of the World Leadership Alliance Club de Madrid and former president of the Latvia. Other distinguished professors as well as several people named by Time Magazine as among the 100 most influential people in the world, and some people listed by Foreign Policy magazine as among the 100 top global thinkers, will join in building the initiatives. As a part of the initiative, the BGF-G7 Summit Initiative weekly newsletter has been launched as of Jan. 26. It will provide fresh reportage and commentary from experts around the world. The Boston Global Forum (BostonGlobalForum.org) was co-founded three years ago by former Democratic presidential candidate and former Massachusetts Gov. Michael Dukakis, who is now a Distinguished Professor at Northeastern University; Prof. John Quelch, the Charles Edward Wilson Professor of Business Administration at the Harvard Business School; Prof. Thomas Patterson, the Bradlee Professor of Government and the Press at the Harvard Kennedy School, and Nguyen Anh Tuan, the CEO and Editor-in-Chief of the Boston Global Forum, and the founder and chairman of VietNamNet Media Company and VietNet, the first Internet Service Provider in that nation.